To evaluate the toxicity of each observed extractable, the safety concern threshold (SCT) is used. 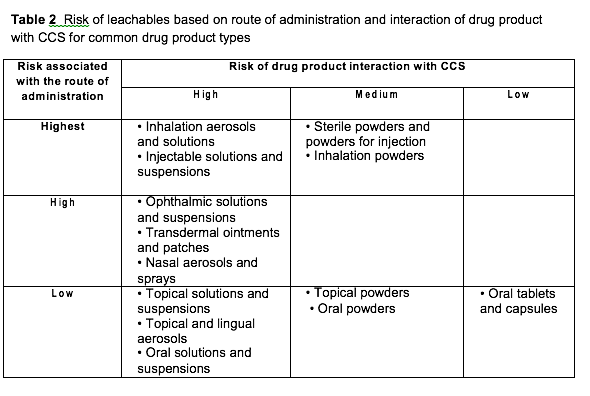 The SCT is the absolute highest acceptable exposure of a patient to a leachable in drug product and is usually expressed in terms of µg of leachable per day. If an SCT is not known, the recommended SCT by the PQRI should be used. The PQRI selected this SCT as representing a threshold below which leachables would have negligible safety concerns from carcinogenic and non-carcinogenic toxic effects. For orally inhaled and nasal drug products (OINDP), the PQRI recommended SCT is 0.15 µg of each individual leachable per day. For parenteral and ophthalmic drug products (PODP), the PQRI recommended SCT is 1.5 µg of each individual leachable per day. 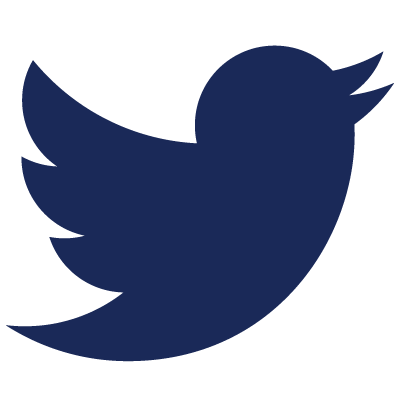 The AET will have units of µg/g unless other units were used in the calculation. Surface area of the component of the CCS or volume of drug product in the CCS instead of the weight may be applicable in some situations. The uncertainty factor is an adjustment for the confidence in the identification and quantitation of the extractables needed for OINDP. For all other types of drug products, the uncertainty factor is not needed. Leachables from container closure systems (both primary and secondary packaging component) that migrate into injectable vaccines and related biological products can have a potentially negative impact on safety and efficacy. To assess the risk from leachables, extraction studies are designed to simulate both intended use and “worst case scenario” models to identify as extractables the leachables that could migrate. At the end of the extraction study, an assessment of the observed extractables is done to determine if the risk justifies the need for additional leachables studies. At Pine Lake Laboratories, we have extensive experience performing extraction studies on container closure systems commonly used for injectable vaccines and related biological products. 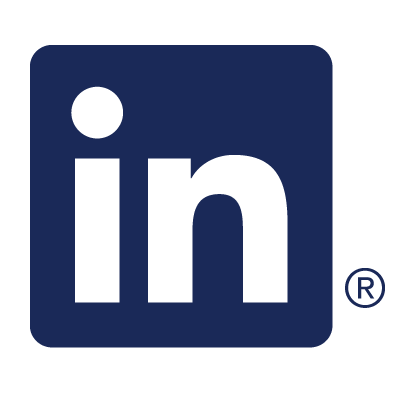 The extraction study design followed at Pine Lake Laboratories for injectable vaccines and related biological products is based upon the PQRI guidance for Parenteral and Ophthalmic Drug Products. Leachables are compounds that migrate into a drug product from the container closure system (or process equipment) under normal condition. Both the primary container closure system in direct contact with the drug product (metered dose inhalers, prefilled syringes, eye dropper, IV bag, etc.) and the secondary CCS which does not the contact drug product (printed labels, boxes, foil pouches, etc.) can be sources of leachables. 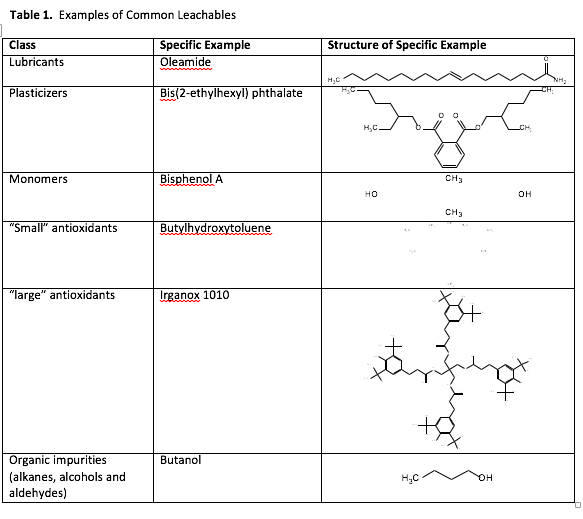 Leachables are the actual compounds that enter the drug product and present both a safety and an efficacy risk. Extractables are compounds that can be extracted from the container closure system (or process equipment) under exaggerated conditions that might become leachables. Extraction Studies are performed on CCS under exaggerated conditions with the goal of identifying all potential leachables. 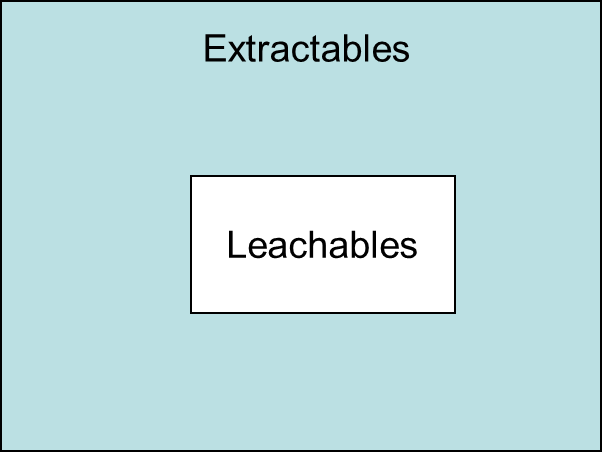 As shown below, under ideal situations leachables are a subset of the observed extractables. 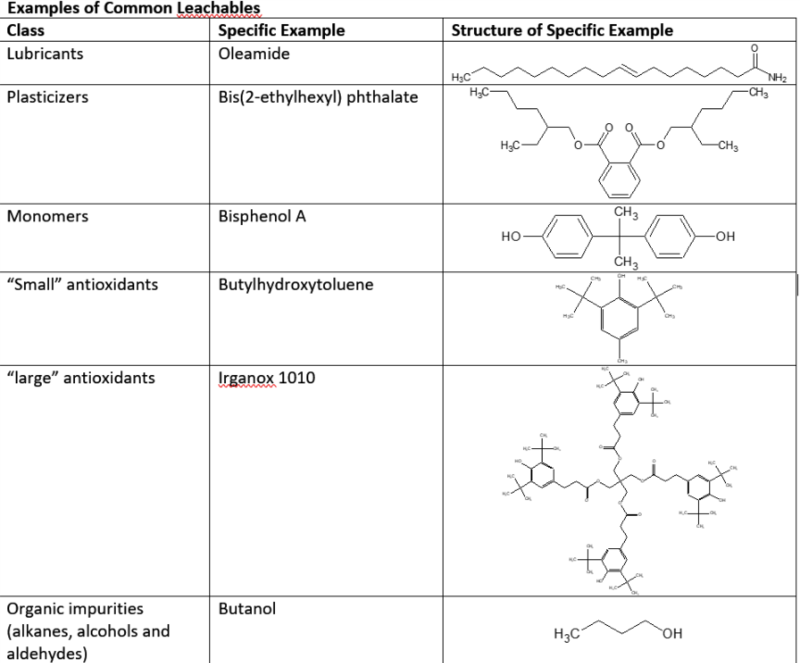 The observed extractables are used to develop analytical methods for leachables in the drug product. Before starting to evaluate drug compatibility and leachables from the infusion pump or other medical devices intended to deliver a drug, an FDA approved drug(s) intended for use with the device must be selected. If the device is intended for just one drug, like an insulin pump, the selection of the drug is obvious. If the device can be used with multiple drugs and multiple routes of administration, select a total of three drugs that are commonly used from the three most common routes of administration. For example, if evaluating an infusion pump that is intended to deliver drugs intravenously and as an epidural, pick two common drugs for intravenous infusion and one for epidural infusion. Once the drug(s) has been selected, pick the simplest formulation of the drug to evaluate drug compatibility and leachables. Pharmaceutical companies had been using the “less than lifetime” thresholds of toxicological concern (TTC) from ICH M7 as alternatives to the conservative 1.5 µg/day PQRI safety concern threshold (SCT) for calculations of the analytical evaluation threshold (AET) used in extractables and leachables testing. FDA has accepted this alternative calculation for most dosage forms, with the exception of orally inhaled and nasal drug products. Well, at the PQRI PODP Workshop at USP Headquarters on April 18 and 19, PQRI announced that its final E&L best practices for parenteral drug products will state that the AET should only be calculated using the 1.5 µg/day SCT. The concern raised by the PQRI toxicology sub-team was that the ICH M7 TTC values for less than lifetime patient exposure were all above the PQRI qualification threshold (QT) of 5 µg/day. This is the threshold for leachables that have sensitization and irritation markers. 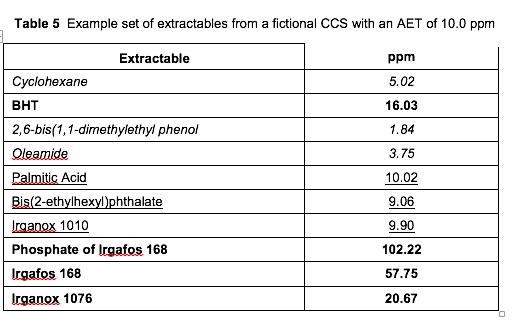 The fear was that extractables and leachables that could potentially be sensitizers would not be reported and qualified by a toxicologist if the AET was calculated using higher TTC values. The ICH M7 TTC values can be used for the qualification of leachables that are carcinogens when the patient dosing is less than lifetime. For example, if a leachable detected above the AET was a carcinogen and resulted in patient exposure of 15 µg/day…then this leachable could be qualified for dosing regimens involving less than 365 days, since the TTC for this exposure duration is 20 µg/day. There was some dialogue between the participants at the PQRI workshop (which included FDA) of possibly raising the SCT to 5 µg/day for less than lifetime exposure since this would be supported by the ICH M7 thresholds for carcinogens and the PQRI QT. Did you know that leachables testing is the exception and not the rule for evaluating and qualifying pharmaceutical manufacturing equipment? Most equipment vendors have a full set of extractables testing data for their manufacturing components generated in many different model solvent systems that bracket the pH, polarity, and ionic strength of most aqueous based drug products. The vendor extractables testing is typically performed according to the “white papers” issued by the Bioprocess Systems Alliance (BPSA) and the BPOG. A scientific based assessment comparing the extractive power of the drug product that will be manufactured using the equipment to the vendors conditions of contact in the extractables testing has to be performed to demonstrate that the vendor extractables profiles were generated under “worst case” conditions. At the PharmaEd Resources E&L Conference in Philadelphia on March 28-29, Dr. Edwin Jao, from FDA, confirmed this practice in his presentation entitled “Equipment Compatibility Issues for Manufacturing of Liquid Dosage Forms— FDA/OPF’s Perspective.” Any “gaps” identified in the correlation of the vendor extractables data to the conditions used in manufacturing the drug substance and/or drug product can be addressed utilizing a simulated-use extraction study. This testing subjects a given component used in the equipment train to a model solvent or placebo under the typical conditions of contact encountered during manufacturing. Pro-active flushing of filters and tubing, points of dilution in the manufacturing process, and purification techniques (such as recrystallization and diafiltration) can also be used to reduce the leachables risk for manufacturing equipment.